We were practically giddy with excitement when our plans came together to visit Myanmar. It’s always been a destination on our list, but getting there has been difficult at times, and downright dangerous at others —Myanmar is safe and now it is open for visitors again, in a big way. It didn’t take us long to discover this country was quite different than any other and it is now our favorite in Southeast Asia. Our best moments in Myanmar started with a sea of endless smiles brightening our days. We felt welcomed like guests visiting a new home. We loved the diversity of landscapes and marveled at the endless spiritual relics. All this, while enjoying the company of people with curious, long-standing customs and rituals. It’s a lofty comment to name a favorite place in such a vast and exciting region. We loved Thailand, Cambodia, Laos, and Vietnam immensely, so how are we able to single out this country as the best in the region? We met the friendliest, most genuine people on our travels — more than anywhere yet. In our many years of traveling together, we’ve never had so many situations where people just want to say hello, converse, or help without wanting anything in return. Smiles and sign language seamlessly, and frequently, replaced verbal communication. Making eye contact and saying “hello” or ming-la-ba, was always returned with a reassuring smile and greeting. Often that gesture turned into a touch on the arm or a laugh as we fumbled through the language. Perhaps it’s the warmth of the people, or because the country is new to tourism, that is what made this trip remarkable. A cab driver from the airport in Yangon took us to our hotel, educated us on the best destinations in Yangon, taught us basic words, and offered maps and books to help our planning. He didn’t ask for anything in return, he just expressed his joy that we were seeing his country. Our bike lock jammed and wouldn’t unlock the back wheel in Inle Lake. All of a sudden, five people came over to help un-jam it for us. I lost my hat when it flew off my head in a songthaew (shared pick-up with seats). A guy jumped on the road, picked up the hat, and proceeded to run towards the truck to give it back! The tour owner dropped by when we returned from our hike to ensure we had a great trip. We don’t get this too often, even at home — what a welcome surprise! Sure. We did have assertive cab drivers approach us after a long bus ride and we were charged more than we should have. Like anywhere, once you learn what things cost, it gets easier to negotiate. We didn’t experience, nor did fellow travelers, any common scams, and we felt safe and comfortable the entire visit. At first, our senses were in complete overload. Yangon was amazing but best in small doses! We walked in intense heat (+41°C) through a smorgasbord of pungent food, tea, and betel nut stalls, as salespeople belted out their offers to on-lookers. An attack of all senses, yet an unforgettable experience. When you visit Myanmar you will be surprised how many traditions are still prominent. Men and women dress in the distinctive, colorful longyi (similar to a sarong) everywhere. Men wearing the longyi with a white dress shirt look rather smart! The most curious wonder was the 2,000-year-old tradition of women, kids, and younger boys wearing thanaka. It’s a yellow-white makeup made from the Thanaka tree. It’s primarily a cosmetic, but known to act as a sunscreen and improve complexion. Women seemed to have incredible-looking skin. Perhaps there’s a lot to learn about this custom in the western world! You must visit Myanmar and see Yangon. The streets of Yangon were lined with a mixture of new structures and old British colonial buildings, some nicely restored while others left in crumbling disarray. The combination evoked our curiosity and wonder about the past. 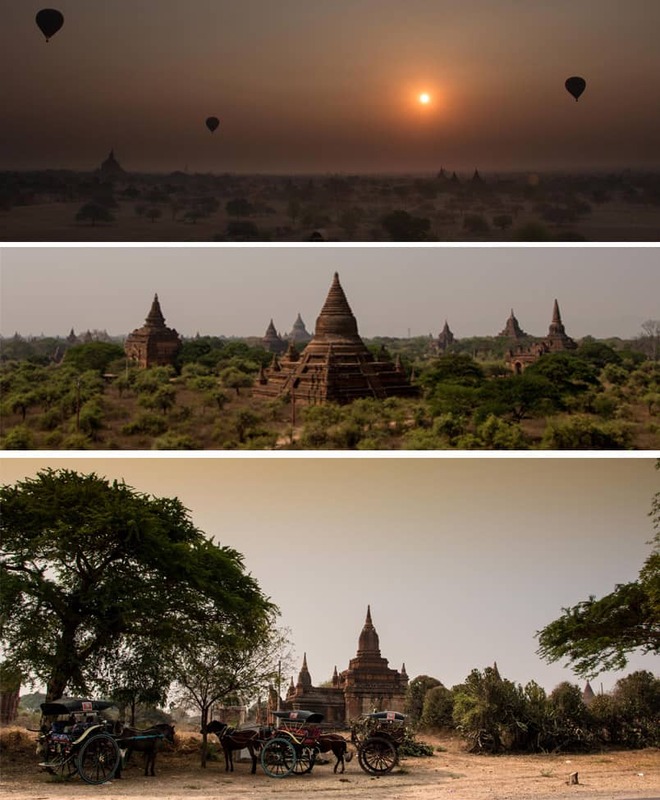 Bagan was a massive stretch of land with over 4,000 temples and pagodas across dry, barren plains. No matter where we looked, there was a spiritual relic in our view. We loved to walk, bike and explore temples whenever or wherever we wanted, without a guide. It was so peaceful sitting on top of a temple to just watch, listen and take in the view. We attended one of the most spectacular cultural events we have ever seen. It was a large and incredible Novitiation ceremony for boys (under 20 years old) entering the Buddhist order as novices (young monks). Although compulsory for boys and common to see this time of year, we attended a massive ceremony where 3,000 people from indigenous tribes traveled great distances to celebrate 145 village boys entering the monastery. If you go to Myanmar in March or April, you’ll likely see some element of this ceremony such as a colorful parade of boys riding on horses, ox, and elephants, with their families walking alongside. We loved the rolling hills of Kalaw. The vast countryside was our start to a wonderful cultural hike for three days and two nights to Inle Lake. We stayed in villages with people from the Danu and Pa-O tribes, watching and observing their daily lives. Spending time in these villages was a healthy lesson in village life. The bonus was the food prepared by our guides was the best food on our trip! Trekking in Kalaw and enjoying conversations and local food while staying in villages. 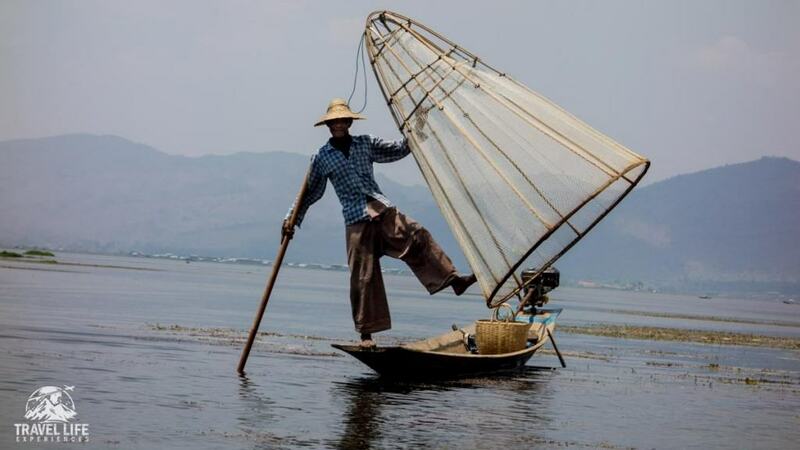 If you visit Myanmar you must go to Inle lake. The mountains peaking through the mist and fog provided the backdrop for life on the water. Fishing boats, immense floating food gardens, and homes on stilts accentuated the lake. We spent hours exploring villages, temples and watched the fishermen paddle with their feet, balancing on the front of the boat. Fisherman on Inle lake at sunrise. All over the country, we felt very much “on display” and somewhat of an attraction at times. Older women and girls often approached us, smiled, touched us, and took our photos (with their phones, as all the kids have them here too). Their reactions to how we look, dress, and behave isn’t much different than us gawking, admiring and photographing them, now is it? Visit Myanmar to get a little bit vulnerable, it’s a good thing. Myanmar people taking photos of us. We used the Lonely Planet Myanmar Guide to plan our entire trip to Myanmar. Visit Myanmar now, here are some tips to get you started! For more of our posts about Myanmar you can find them here!